The Pioneers lead the way with 10 BCHL grads on their roster. This is the third time in the last four years Denver has made it to the Frozen Four and their first since winning their eighth national championship in 2017, which is second only to Michigan’s nine titles. Like UMass, they have yet to surrender a goal during the tournament as they beat Ohio State 2-0 and American International 3-0 on the opening weekend. The Pioneers are led offensively by a pair of former BCHL players – leading scorer Liam Finlay (36 points) and senior forward Jarid Lukosevicius (29 points), who scored a hat trick in the championship game in 2017. 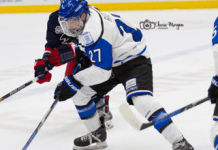 The other players representing the BCHL on the Denver roster include Vernon Vipers alum and Montreal Canadiens 2018 draft pick Brett Stapley, former Wenatchee Wild defenceman and Vegas Golden Knights 2018 fourth-rounder Slava Demin, Wenatchee alum Devin Cooley, Penticton Vees grad Griffin Mendel, Merritt Centennials alum Tyler Ward, former Chilliwack Chief Kohen Olischefski, Langley Rivermen alum Ryan Barrow and Cowichan Valley Capitals grad Michael Corson.